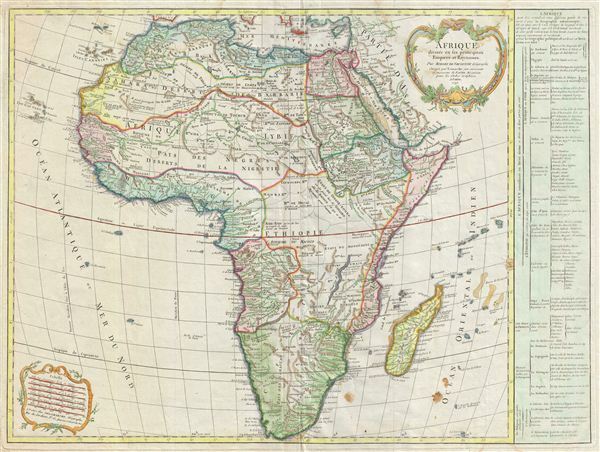 A stunning overview of Africa on the cusp of European exploration into the interior. Afrique divisee en ses principaux Empires et Royaumes. An important an unusual c. 1795 map of Africa by Robert de Vaugondy. Vaugondy frist issued this map in 1749 and it went through at least seven states with editions appearing as late as 1810. Issued on the cusp of Europe's great wave of exploration into the interior of Africa, Vaugondy loosely based this map on the earlier work of De L'Isle and Sanson with updates to comply with the most recent cartographic information coming into Paris. The map offers impressive detail of the largely unexplored interior, featuring the names of various tribal groups and indigenous empires throughout, while at the same time, studiously avoiding presumption regarding the general geography of the interior. The well mapped coastline is consistent with earlier maps of the region, though the projection has been slightly corrected. The known lands, most explored by missionaries and early colonists, of Mediterranean Africa, egypt, Abyssinia, Morocco, the Niger Delta, and South Africa and the Congo, are mapped according to convention with a few minor updates. The interior is largely blank of geographical features. Vaugondy abandons the tradition of filling the blanks with speculative mappings of the White Nile, the Niger, and the Mountains of the Moon. Rather he focuses on known missionary reports containing both first hand evidence of the interior and second hand information gleaned from the African indigeni. These include an embryonic mapping of Lake Malawi, with the note (in translation) that reads, 'It is claimed that his lake extends far to the north.' Thus are europeans beginning to understand the Rift Valley and anticipate some of the greater lakes soon to be discovered further north, including Nyasa and Victoria. To the right of the map proper a table offers a breakdown of the religious, people, islands, and cultures of Africa. As stated, this map went through numerous states, both under Vaugondy directly and by his successors, Fortin, and Delamarche. Most of the changes in later editions focuses on the cartouche work and titling and had little to do with the map itself. Gilles (1688 - 1766) and Didier (c. 1723 - 1786) Robert de Vaugondy were map publishers, engravers, and cartographers active in Paris during the mid-18th century. The father and son team were the inheritors to the important Sanson cartographic firm whose stock supplied much of their initial material. Graduating from Sanson's map's Gilles, and more particularly Didier, began to produce their own substantial corpus of work. Vaugondys were well respected for the detail and accuracy of their maps in which they made excellent use of the considerable resources available in 18th century Paris to produce the most accurate and fantasy-free maps possible. The Vaugondys compiled each map based upon their own superior geographic knowledge, scholarly research, the journals of contemporary explorers and missionaries, and direct astronomical observation - moreover, unlike many cartographers of this period, they commonly took pains to reference their source material. Nevertheless, even in 18th century Paris geographical knowledge was severely limited - especially regarding those unexplored portions of the world, including the poles, the Pacific northwest of America, and the interior of Africa and South America. In these areas the Vaugondys, like their rivals De L'Isle and Buache, must be considered speculative geographers. Speculative geography was a genre of mapmaking that evolved in Europe, particularly Paris, in the middle to late 18th century. Cartographers in this genre would fill in unknown areas on their maps with speculations based upon their vast knowledge of cartography, personal geographical theories, and often dubious primary source material gathered by explorers and navigators. This approach, which attempted to use the known to validate the unknown, naturally engendered many rivalries. Vaugondy's feuds with other cartographers, most specifically Phillipe Buache, resulted in numerous conflicting papers being presented before the Academie des Sciences, of which both were members. The era of speculatively cartography effectively ended with the late 18th century explorations of Captain Cook, Jean Francois de Galaup de La Perouse, and George Vancouver. Very good. Original centerfold exhibits some wear. Minor spotting lower right quadrant. Minor water stains, mostly to margins, at top and bottom of map - see image. Afriterra 875 (1749 edition). Pedley, M. S., Bel et utile: The World of Robert de Vaugondy Family of Mapmakers, #424. Tooley, R. V., Collector's Guide to Maps of the African Continent and Southern Africa, pp 93-94.